The wrist and hand are incredible. You can make a strong argument that they are our strongest distinguishing characteristics as humans, and reams of academic paper and litres of ink have been expended on the implications of this. It has been argued, for example, that our dexterous hand (and consequently tool) use is one of the factors that drove the evolution of our cumbersomely large and wonderfully complex brains. Anyway, the wrist and hand consist of twenty seven separate bones (not including little floating bones called sesamoid bones, of which the number varies between people). You then have two sorts of muscles that act on the wrist and hand; the intrinsic muscles, which are in the hand itself, and the extrinsic muscles, which run down from your forearm. Some of these extrinsic muscles will also act on the elbow, just to confuse matters further! Add to this that in order to get full use out of our hands, we also need to be able to rotate the forearm, a movement called pronation (turning your hand so that the palm points towards the floor) and supination (turning your hand so that the palm faces upwards toward the ceiling). 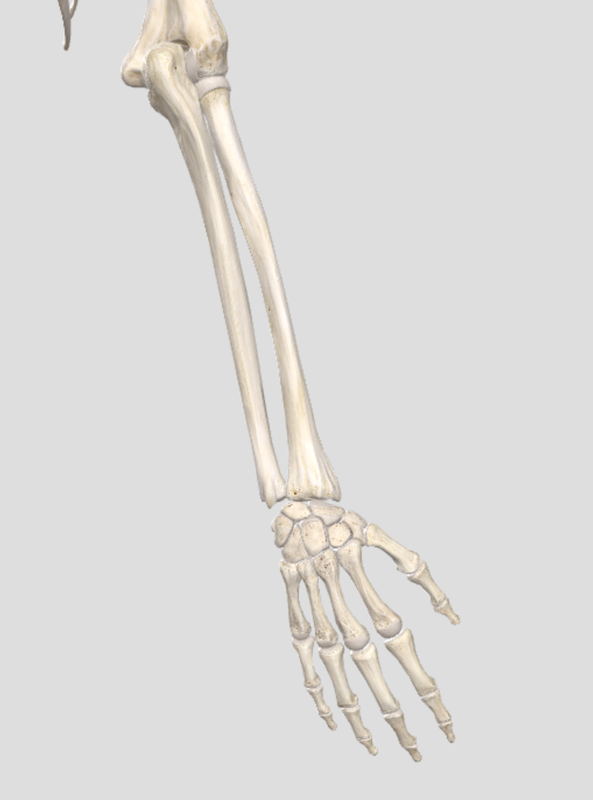 This type of rotation takes place just below the elbow, where the two bones of the forearm meet. Each of these joints does not necessarily move that much, but all put together, we get the astonishingly precise and deft movements involved in writing, watch-making, knitting, and other feats of creativity and dexterity for which humans are justifiably proud. Unfortunately, as most people know, the more working parts there are in something, there more there is that can go wrong! Also unfortunately, we rely so much on our hands, that when something does go awry, we often have no strategies in place for dealing with it. Easy to say "just write with the other hand", but somewhat harder to put into practice! Your osteopath will assess your hand and wrist fully, in the context of the whole arm and its interface with the rest of the body (shoulder, neck, ribs, thorax etc.). We will then advise you on the best way of managing your issue. This may involve taping or even splinting, dry needling, home exercises, or advice as to what the next steps may be (medical imaging, pharmacological management, or even surgery). Do you suffer from hand, wrist or forearm pain?